Yesterday I totaled my car. As many of you know, I recently quit my full-time job to chase a dream of resourcing churches and ministries with web and graphic design. It was probably the scariest thing I’ve ever done in my life. When I gave up a steady paycheck for the freelancer’s life, I remember God telling me he’d provide for me and my family. I didn’t know how he’d do it, but I trusted that he would. Do you think it’d be better to hold on to that money in case something happens? God promised us he would provide for us. He will continue to provide. God promised us he would provide for us. He has provided. He will continue to provide. On Wednesday morning, we put the check in the mail to pay off her car. 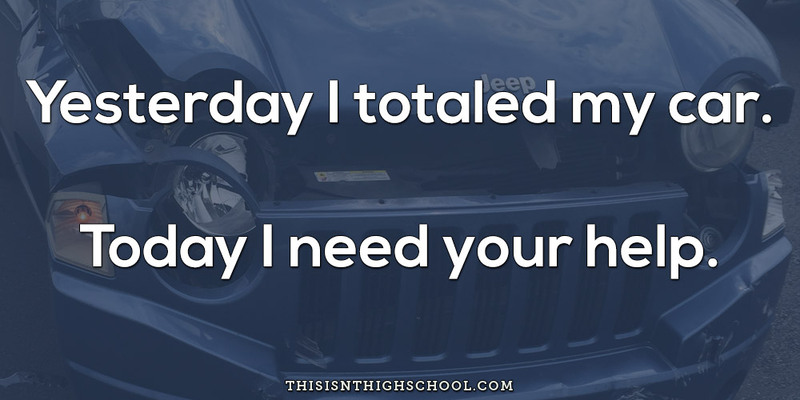 On Thursday morning, I totaled my car. I could live in fear of how to move forward. Just like before, I’m going to choose to trust in God’s provision. I haven’t heard how much money we’ll get from the insurance company yet, but I do know my car wasn’t worth much. Nicole and I are working to get out of debt completely (gotta love student loans, right?) so we don’t want to take a new loan out for my next car. With a baby girl coming in two months, the desire for a safe, reliable car is at an all time high. 1) Pray that God will provide. I have no clue what that even means. All I know is God is way bigger than I can imagine and he can provide in ways I can’t begin to comprehend. 2) Help me find a great, inexpensive car. I know that’s a gigantic ask. But again, I know I have a gigantic provider. Do you know someone who has a great car they’d like to get rid of for cheap? Maybe they just got a work car and don’t need their old one. Or maybe a family member passed away and their estate is looking to sell their car. Whatever the situation, if you know of something, I would love if you could pass it along. 3) Share this post with your friends. I know this is breaking the #1 social media rule, but I’d love if you’d allow me to tap into your relationships and your networks. For all I know, the person God wants to use to provide for my family is your second cousin’s third grade teacher who is friends with your mom on Facebook. Would you take a minute and share this post on Facebook or Twitter? Yesterday I totaled my car. Today I need your help. Here are three things you can do. The reason I ask for your help is simple. When this is over, I want to be able to tell the story of how God used people I may not even know to provide for me and my family. I want to brag on the fact that our God is a great dad and truly cares for his kids.